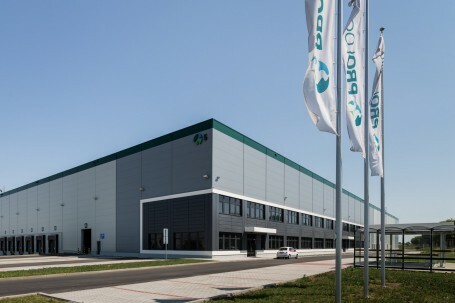 PRAGUE (July 7, 2015) — Prologis, Inc., the global leader in industrial real estate, today announced that it has completed three build-to-suit (BTS) facilities, totalling more than 76,000 square metres, around Prague. 32,100 square metres for Červa, a wholesale personal protection equipment supplier, at Prologis Park Prague-Airport. The building features modern cross-dock facilities, including an outside ramp for side loading, tailored to the customer’s requirements. 31,730 square metres for Mall.cz, an online consumer goods and electronics store, at Prologis Park Prague-Jirny. The environmentally-friendly facility includes strip skylights, an energy consumption monitoring system, air conditioning and electrically-powered exterior sun blinds, among other sustainable solutions. 12,350-square metre production facility for an automotive services provider at Prologis Park Prague-Jirny. Prologis Park Prague-Airport currently comprises two buildings situated on 33 hectares of land with the potential for up to 63,000 square metres of development. Located next to the R6 highway, just five minutes from Václav Havel Prague Airport, the park provides excellent access for national and international traffic and trade routes via the Prague ring road to the D5 highway, which connects Prague with Pilsen and onto Germany. Prologis Park Prague-Jirny is a state-of-the-art distribution park, currently comprising 266,000 square metres of distribution space. The park is located 20 kilometres east of Prague with direct access to the D11 motorway, enabling efficient distribution to local markets as well as to neighbouring countries. Prologis is one of the leading providers of distribution facilities in the Czech Republic with more than 865,000 square metres of logistics and industrial space (as of March 31, 2015).